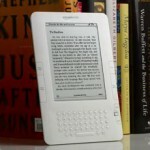 Amazon.com announced today a new version of its Kindle reader. I’ve occasionally seen people using a Kindle on the NYC subway. It’s a beautiful device and I want one. The Kindle2 will ship later this month. You can order it from Amazon.com for $359. First, it’s a gray scale device, and with only 16 shades of gray at that. It somewhat makes up for this with higher resolution (167 ppi) but still, I read many more documents than just books and color is important. Secondly, it’s too expensive. Cut the price in half and it could revolutionize education in this country and especially abroad, where the cost of physically acquiring and moving textbooks is prohibitive. I’m hoping that Amazon realizes the potential in the Kindle line and does something truly innovative in marketing it. Otherwise, it’s just a matter of time before Apple comes out with a large format iPod-Touch and eats Amazon’s lunch.